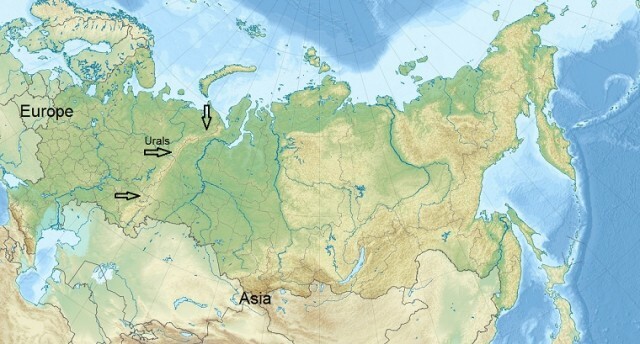 THE URALS EXTEND over 1,553 mi (2,500 km) from the ARCTIC OCEAN to the steppes of KAZAKHSTAN. The territory of nearly 318,148 square mi (824,000 square km) is subdivided in the oblasti (districts) of Perm, Cheliabinsk, Kurgansk, Orenburg, and the Autonomous Republics of Udmurtia and Bashkiria. The Ural highlands, with the highest peak of Narodnaya (6,213 ft or 1,894 m), separate the East European plains from the west Siberian lowlands. From the north to the south, the mountains touch different climatic zones. In the TUNDRA of the polar Urals (Poliarnyi Ural) the winter lasts nearly seven months. The summer in the southern Orenburg district is almost dry, similar to nearby Kazakhstan. Since the Urals—far away from the ATLANTIC OCEAN—lie in the heart of the Eurasian continent, a continental climate is characteristic for the region. In winter, temperatures can go down to -40 degrees F (-40 degrees C) in the southern areas, and to -76 degrees F (-60 degrees C) the north. In summer temperatures in the steppe zone can go up to 104 degrees F (40 degrees C). In the north, the Urals are exposed to cold winds from the polar sea, and in the south to hot steppe winds from central Asia. As such, the highlands of the Urals present a transition zone. The Urals are rich in iron deposits. Industrialization of the region began under RUSSIA’s Peter the Great in the late 16th century. Thanks to the investments of factory owners like the Demidovs and the Striganovs, the Urals became one of the world’s largest producers of metal. By the 1860s, Ural metallurgy had fallen behind new international metallurgical advances. Whereas, at that time, English factory owners used coal for metal melting, the Russians used wood as fuel in blast furnaces that made production inefficient. In the late 19th century, finance minister Sergei Vitte encouraged the industrialization of UKRAINE instead of the Urals. In 1900, Ukraine produced nearly 60 percent more metal than the Urals. With Josef Stalin’s coming to power in the late 1920s, Ural industry experienced a renaissance. The central government invested heavily. The first Five-Year Plan of 1927 scheduled the creation of a big industrial region combining the coal resources of the west Siberian coal deposits with Ural metallurgy. This was the birth of the giant steel combine of Magnitogorsk, the so-called UKK (Ural-Kuznetsk Combine). The main goal of Stalinist industrialization was the creation of a second industrial basis in the heart of the Eurasian hinterland that was not vulnerable to enemy attacks, as was the western Soviet republic of Ukraine. The industrialization of the Urals in the 1930s suffered from a labor shortage. Therefore, recruitment was based on forced labor and the Urals became part of the Gulag prison system. It has been estimated that the Urals labor camp population comprised 123,547 households (571,355 people). Magnitogorsk laid the foundation for new industries in the Urals, like automobile production and nickel mining. Today, the Urals are recovering from the Asian economic crisis of the 1990s. In 2002, the Urals had foreign trade of $26.4 billion. After the meeting of Presidents George W. Bush and Vladimir Putin at the July 2001 Genoa Summit, several U.S. companies began investing in Ural manufacturing enterprises.